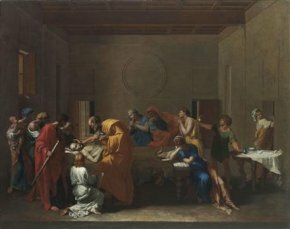 13/8/12 - Fundraising drive - Cambridge, Fitzwilliam Museum - Since the sale of Nicolas Poussin’s Ordination to the Kimbell Art Museum (see news item of 1/7/11 in French), we now know alas that the Seven Sacraments painted for Cassiano del Pozzo will inevitably be scattered far and wide. The dispersion first started over 70 years ago with the purchase of Baptism by the National Gallery of Washington. This time, a British museum, the Fitzwilliam Museum of Cambridge, wishes to acquire Extreme-Unction . Temporarily barred for export (only until November), the painting is being offered for the very attractive sum of 3.8 million pounds when it is in fact estimated at 14 million (Ordination sold for 15 million). Just like the Manet which was recently purchased (see news item of 8/8/12) by the Ashmolean in Oxford, it benefits from a tax deduction system, resulting in this very low price. In fact, the Oxford’s museum success is no doubt responsible for the Fitzwilliam’s initiative. However, here again, the Lottery Fund will probably have to step in to help in closing the sale as for the moment, the Cambridge museum has only raised one tenth of the needed amount. We learned the news on Bendor Grosvenor’s excellent blog, Art History News.